Plot Outline: Dreamer Max, ridiculed by his classmates, conjures up his perfect dreamworld...the Planet Drool. But his dream is more powerful than even he suspects, and his favourite dream super-heroes, Sharkboy and Lavagirl, materialise on Earth. They need help from Max. All is not well in Max's dreamworld. An alien intelligence is interfering and darkness threatens his beloved Planet Drool. Is it true, as Sharkboy and Lavagirl say, that only Max, the powerful dreamer, can stop it? 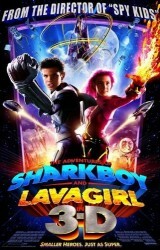 Max takes off on a wild and dangerous journey to the fantastic Planet Drool with Sharkboy and Lavagirl. Can they discover the source of the danger? Will they be able to stop it in time?